I think most of us will agree that Hollywood, as an industry, doesn’t take nearly enough risks. Studios are perfectly content with following a pattern, playing in their own familiar sandbox with their same old toys until someone else in school discovers what the new, cool trends are going to be. If someone else can make a buck off of a fresh idea, it may just galvanize them into trying something new of their own. But even then they’re not always going to jump onto the bandwagon — Avatar made more money in a few months than entire nations do in a year and we have yet to see rival studios launch similarly ambitious sci-fi epics. I don’t blame them, really. I’ve always respected the fact that making movies is a business and that certain investments are just too risky to make. So I understand that studios aren’t lining up around the block to throw hundreds upon hundreds of millions of dollars at filmmakers with bold visions. I don’t, however, understand why studios are so resistant to taking smaller risks, or why they’re so afraid to tread new ground with old or established properties. Take Predators for example. There’s as much to like about Nimrod Antal’s re-introduction of the iconic character as there is to dislike, but the biggest obstacle holding it back is its adherence to old times. Obviously you shouldn’t change an icon like the Predator (though they did), but if you’re going to set a film on the Predator’s home world, at least make that world look different than … Hawaii. Change things up; change the climate, the foliage. Don’t just add some extra moons and call it a day. It’s not just Predators, of course. All blockbuster franchises (many of which, of course, tend to fall in the sci-fi/fantasy realm) fall into a groove where they are afraid of changing the environment of their movies out of fear that audiences will reject them. But I don’t think anyone really cares about altering a property’s world so long as the fundamentals stay the same. In fact, I think people will actively embrace it. I’m sure I’m not the only one who, as a kid, identified each of the original Star Wars films as “the one where they go to the ice planet Hoth” or “the one on Endor.” Most franchises fizzle out at the third film, which is precisely when they should get experimental with new world-building, and that is precisely the lesson I think Hollywood should take from the game series BioShock, which will soon be releasing its third entry, BioShock Infinite. I struggle to think of another sci-fi franchise that mas made that radical of a shift with its world-building. And yet, if you’ve played the first two games, there is absolutely no mistaking Infinite as anything but a BioShock game. 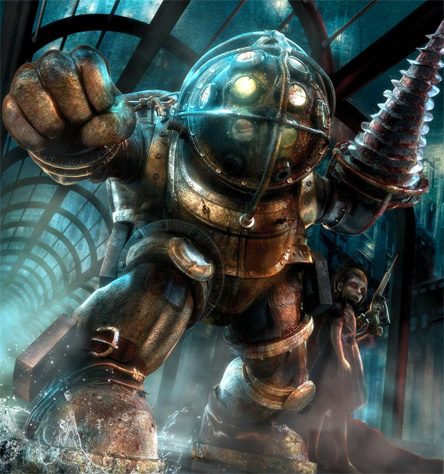 The art deco design, then steampunk-ish Big Daddy hand, the bizarre psychic abilities. Those are the fundamentals; those are all people need to “get” the series. The setting clearly isn’t crucial. I also struggle to think of any time I’ve been this excited for a third entry in a franchise based solely on a trailer. It’s entirely due to that promise of creativity, that the minds behind the series know when elements of their world are getting stale. Hollywood is perfectly content with letting things stale, though. They underestimate our willingness to go to new places, to accept new dynamics. But so long as the personality is the same, I don’t think audiences will mind one bit.